One of the most anticipated games of 2012 to be reworked from it’s original design was Netrunner: Android, released by Fantasy Flight Games. Based on the critically acclaimed 1996 original game by Richard Garfield, known to many as the designer behind the collectible-card-game behemoth Magic: The Gathering, Netrunner: Android brought a contemporary touch to the asymmetrical game that pitted two players- one representing a runner, or hacker, the other a large megacorp bent on advancing ‘agendas’ which the runner targets for liberation- against each other for contest of supremacy in a game world that blended both the real and digital realms of existence. I had many personal memories of playing the original game, and was excited to see this design from my youth resurrected for a new generation of gamers. Instead of pursuing the collectible card model, like Magic: The Gathering does with its randomized ‘booster’ packs sold in stores, Fantasy Flight decided to release an entire core set of cards for both the Runner and the Corp players to assemble their decks. This decision was a boon for someone like myself, who really didn’t want to spend the time and money necessary to acquire all the cards contained in this new game. (Anyone who has ever tried to collect a full set of cards for a Magic expansion knows what I’m talking about) Yet beyond simple economics, having the entire core set allowed me to ask some interesting questions regarding the changes made to this new edition of Netrunner. At the Connections Conference, held this past summer in Washington D.C., I gave a presentation on evaluating board game designs as temporal fingerprints of their era. A game design about NATO forces taking on the Soviet Union from the 1980’s will be quite different than one designed in the 1990’s, or even 2010. Each will bear design assumptions and philosophies unique to their time, and the careful observer can parse the zeitgeist of two similar designs separated by time for historical analysis. Netrunner: Android offered the perfect opportunity to pursue such an analysis, one that would be better than comparing similar designs because it was, essentially, a re-make of the same basic design players engaged with in the original version. Sixteen years marked the difference between the new and original versions of the game, and for a design centered on modeling cutting-edge use of technology the depiction of the ludic worlds contained within both designs would provide very interesting points of comparison. I would like to use the rest of this post to make some visual comparisons between the two versions of Netrunner, with some commentary as to the essential differences found between. Let’s start with the Runner. From a purely aesthetic perspective, the cards of the original Netrunner utilized a mix of drawn illustrations and images created through CGI. Here one can clearly see that ‘Wild Card’ is a CGI, while ‘Total Genetic Retrofit’ is a hand-drawn illustration. This is really a minor point (and one that could be challenged by someone who has more ‘inside’ knowledge), but if we are analyzing the temporal fingerprints of this particular design then it is worth noting that this version came from an age where artists were, in greater numbers, incorporating CGI into their work. Compare this to the updated version where, I would guess, artists utilized far more CGI than hand-drawn illustrations in their card artwork. Perhaps the idea of using a ‘public terminal’ as depicted in ‘Social Engineering’ made more sense in 1996, but in 2012 this sort of imagery borders on the ridiculous in an age where smartphones are rapidly approaching ubiquity in terms of accessing information. 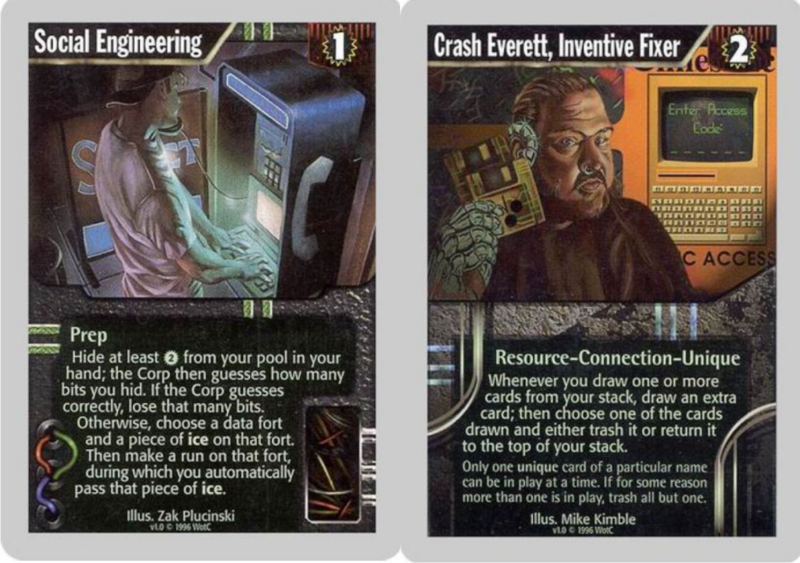 Crash Everett, too, sports 3.25 inch floppy disks, a technology that was already past its prime when the original Netrunner debuted. Even though this is a game that places itself in the near-future in terms of setting, in order to more meaningfully connect with players it calls forth imagery of, then, current technology to help make the connections between gameplay and theme easier to summon for the individual player. What about the new Runner cards? How are they different? With regards to technology, the new cards clearly feature a more contemporary take. One new ‘category’ of cards introduced by Fantasy Flight is the ‘Mod’. 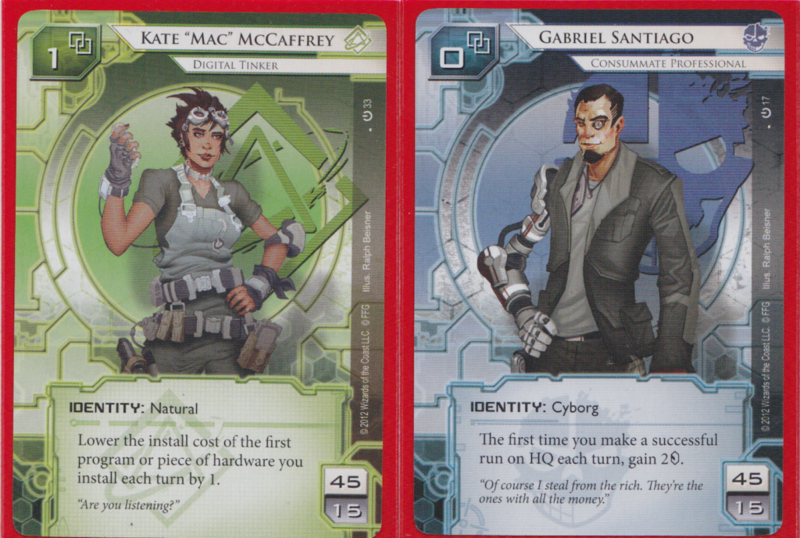 In the original, core set of Netrunner there were no ‘mod’ cards, and one could point to several cultural shifts- the most apparent being the DIY ‘Maker’ movement- that made this sort of ludic shift more acceptable and understandable to gamers in 2012. One only has to look at the world of computer gaming to see the effect of ‘Mod’ culture in our present day, especially among gaming groups. Another new card category for the updated Netrunner centered on themed identities for both the Corp and Runner players to assume. 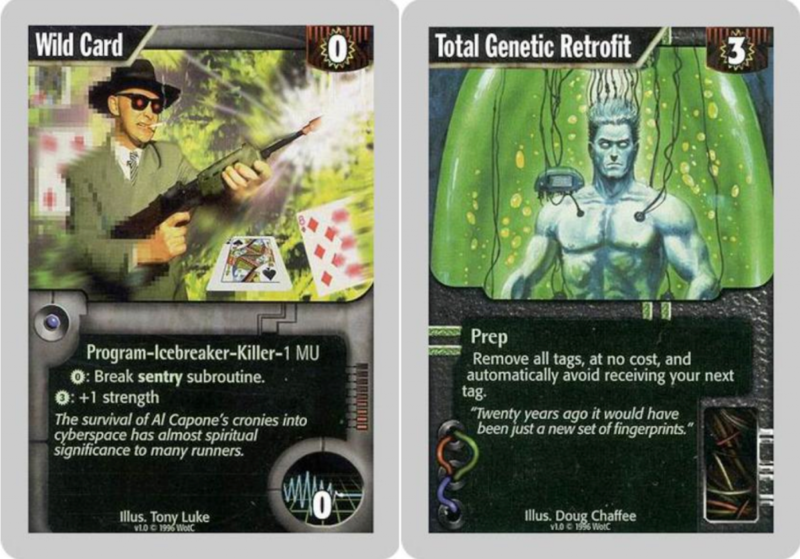 In the original Netrunner, both players assumed ambiguous roles. In the new Netrunner, players must assume one of several identities that bring with them a selected suite of themed cards. For mainstream gamers in 1996, the idea that hackers could take on their own notable personas was a new idea at best. They were often portrayed as loners and social outcasts with exceptional computer skills, evidenced by pop culture depictions found in the 1995 movie ‘Hackers’ or the ‘Lone Gunman’ trio Mulder and Scully sometimes dealt with in The X-Files. In 2012, contemporary history is replete with stories of individual hackers and the idea that an individual could acquire the skills one would associate with hacking is not as far fetched as it would have seemed in 1996. In the next installment of this temporal fingerprinting, I will turn to the Corporate cards found in the old and new versions of Netrunner. While there are some marked differences found in the original and contemporary portrayal of the Runner’s side of things, the Corp cards produce an even more striking dichotomy and suggest even bigger shifts in the cultural landscape that separates the two temporally distinct designs.